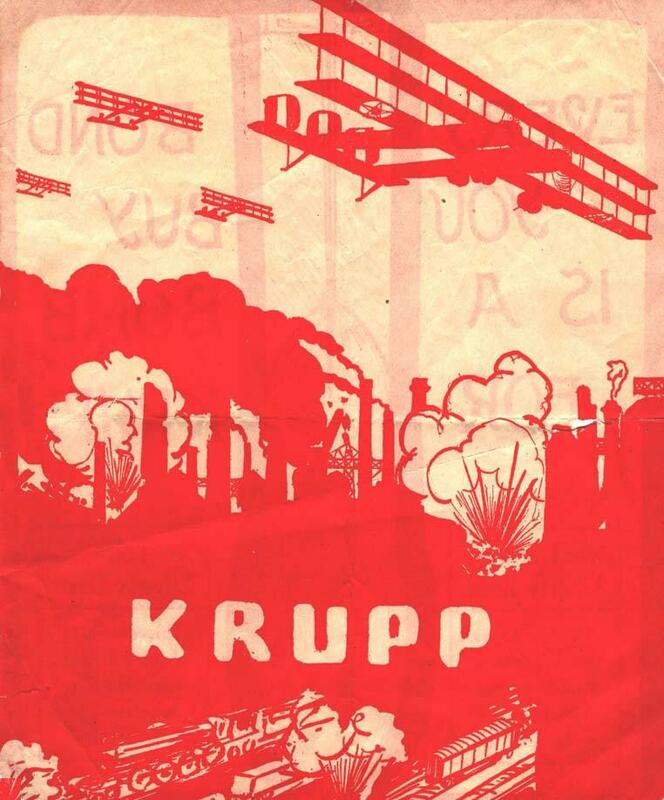 During WWII, there were a number of leaflets printed and dropped that simply depicted a bomb. It was meant to terrify the finder and show him that the leaflet could have easily been a bomb that would have destroyed him, his family, his home and perhaps even his city. At the same time, the warring nations would sometimes drop the image of a bomb over friendly civilian territories to catch the attention of the finders and motivate them to send money to buy war stamps or bonds or subsidize patriotic organizations. These leaflets must have caused great apprehension because the message was true. The leaflet could have been a bomb and the finder could be dead. 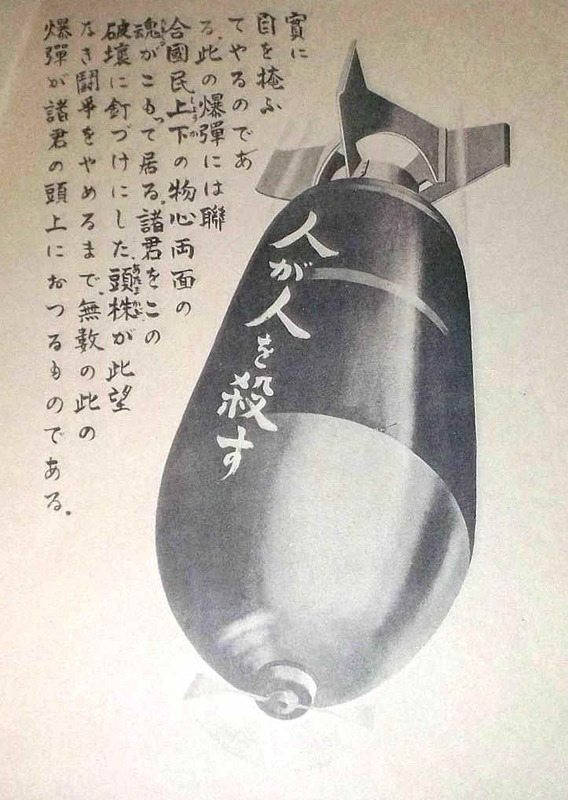 America threatened Japan with leaflet depictions of bombs on more than one occasion. Office of War Information leaflet 2013 is very impressive from a visual standpoint. 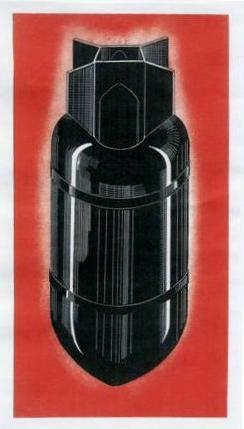 It shows a highly detailed and polished vertical black bomb on a red background. There is no text on the front. Curiously, the same exact image is found on leaflet 2014. I will translate both leaflets. These bombings will continue until your militarist leaders give up. You know we have the strength to continue until your beautiful land is laid to ruins. The militarists are continuing the war because they are afraid of punishment. You are the ones who suffer. The whole nation suffers to satisfy a few selfish men. Force your leaders to bring an end to a hopeless war. That is the best prevention against bombing. This leaflet could have been a bomb. This is to warn you away from military installations, factories, railways, and harbors where our bombs will strike again and again until the Gumbatsu quits this hopeless war. Stay away from military objectives! The Gumbatsu is that mix of the military and big business that President Eisenhower would call the Military-Industrialist Complex years later. Frances created a portrait of a menacing black bomb. She rendered its three dimensionality, cool tactile surface, and compact geometric shape through a precise hatching technique and fine lines. Set against a red background, the bombs perfect appearance emphasizes its inhuman effectiveness as a modern weapon of mass destruction. I seldom add all-text leaflets to these stories because I believe that the reader wants to see interesting images. A picture is truly worth a thousand words. But, this Allied leaflet dropped right after D-Day fits this theme so well that I thought I had to add it. 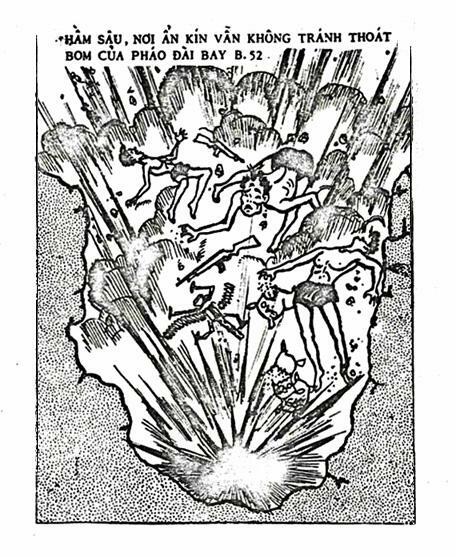 It does not depict a bomb, but basically tells the Germans that they are a target for Allied bombing and cannot do a thing about it. American aircraft will bomb them on the way to Russia, land and reload and refuel, and then bomb them on the way back. I don't know if any of that is true, but it must have terrified the Germans. This is not what we prefer to do, but this is war. Behind this bomb is the full moral and material power of the United Nations. Unlimited numbers of bombs will rain on you until your leaders recognize the futility of the struggle they have condemned you to. Here is the latest model of the incendiary bomb which the liberators are beginning to drop in the millions on your towns and villages. It is the final product of their science. The perfection is such that you will be able to see children killed outright or burned alive and your homes destroyed in an instant. The text goes on to talk about the foolishness of waiting four years for Allied liberation when they have never liberated anyone. It recommends that the Frenchmen join with the Germans for a brighter and better France. It is interesting to see how the enemy took this very American image of a bomb and used it for his own purposes. When the Japanese force makes it attack, Hongkong cannot be escaped from the most fierce bombardment by the Japanese Air Armada. Even with no aid from the land force, it is certain that Hongkong will be smashed into pieces from the air. British officers, we appeal you to consider the very fact. Do not kill your men in meaningless resistance! I like this Japanese poster a lot. 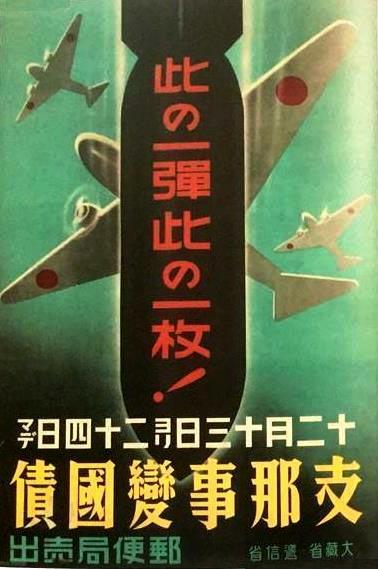 It depicts Japanese bombers overhead and one large falling bomb in the center. The poster is asking the people to buy postal war bonds in commemoration of the 1937 China Incident. Apparently the Japanese could not bring themselves to say that they had started a war in China. On the night of 7 July 1937, Japanese units conducted military exercises. Japanese and Chinese forces outside the town of Wanping exchanged fire at approximately 23:00. When a Japanese soldier, Private Shimura Kikujiro, failed to return to his post, the Japanese demanded permission to enter Wanping to search for the missing soldier. The Chinese refused. The soldier was found, but the disagreement escalated. This incident is usually considered the start of the Sino-Chinese war (1937-1945). The bond drive takes place from 13 to 24 December, but no year is mentioned. The bonds were sold at the post office and the poster was produced by the Ministry of Communications and the Ministry of Treasury. 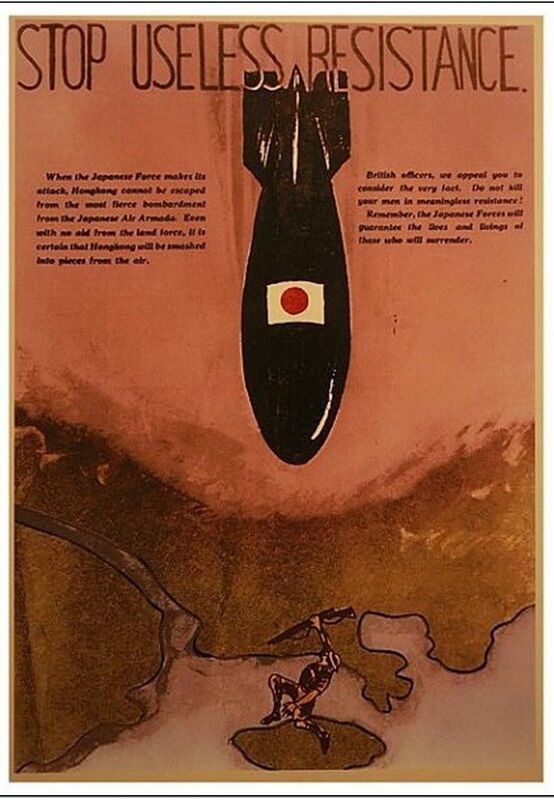 It is a good use of the bomb image and certainly makes a point about the power of the Japanese Air Force. 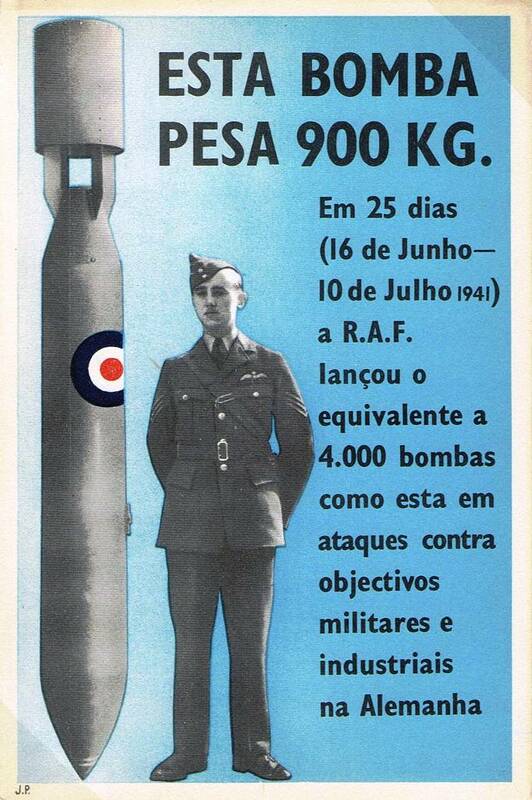 In 25 days, 16 June to 10 July 1941, the RAF dropped the equivalent of 4,000 bombs like this in attacks on military and industrial objectives in Germany. 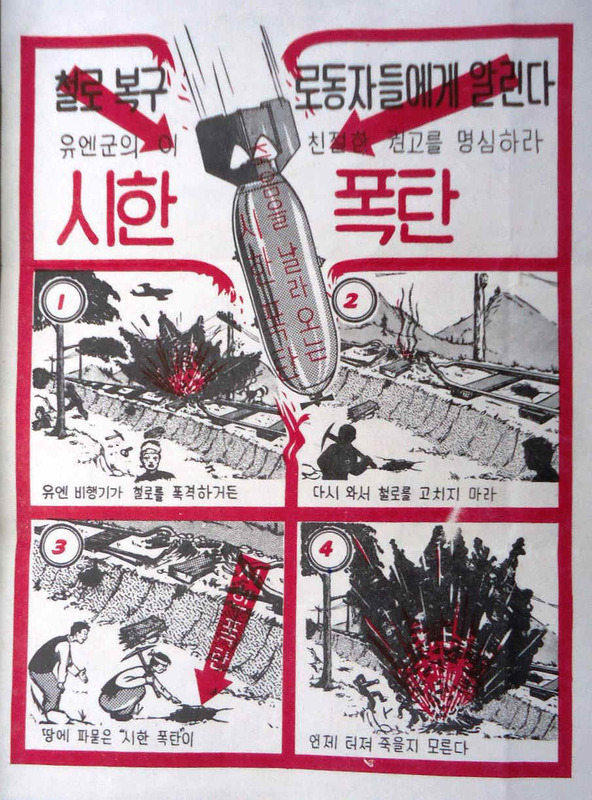 This bomb leaflet purports to be a friendly warning for the North Korean workers to stay away from bombed railroads because some of the bombs are timed and could explode after a certain time and that could kill the civilian laborers. Of course, what it really does is keep the railways closed and unrepaired and stop troop movements if the workers followed the instructions in the leaflet. And, there is an excellent chance that the workers would be executed by the Communists if they refused to work. This leaflet could have been a bomb and brought death to you. 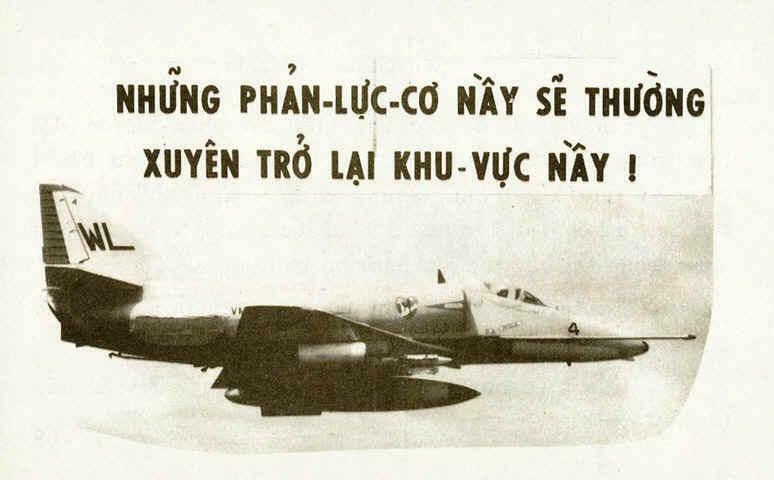 The Government of Vietnam and its Allies know you are here. They could have dropped bombs on you instead of leaflets but they wish to give you a chance for a new life, free from oppression and hardships. Return to the Government of Vietnam and a peaceful happy life. I love working with different translators because they all found the text slightly different. The three translations I got back are this could have been a bomb, this should have been a bomb and this was supposed to be a bomb. There was discussion about the text and some thought that is was not quite right; a very southern Vietnamese. I told them that the ARVN 9th division requested this leaflet. 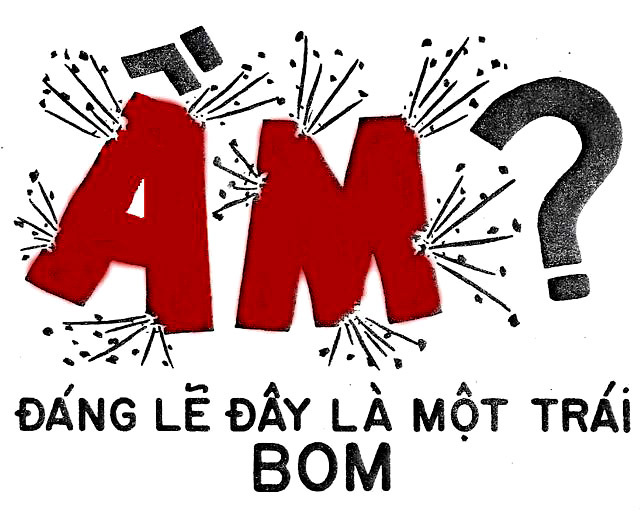 They thought that explained it all because Dang Le is distinctively Southern speak and the 9th ARVN Infantry Division operated in the south (The Mekong Delta). One friend said that everyone knows the Northern and Southern dialects are different. 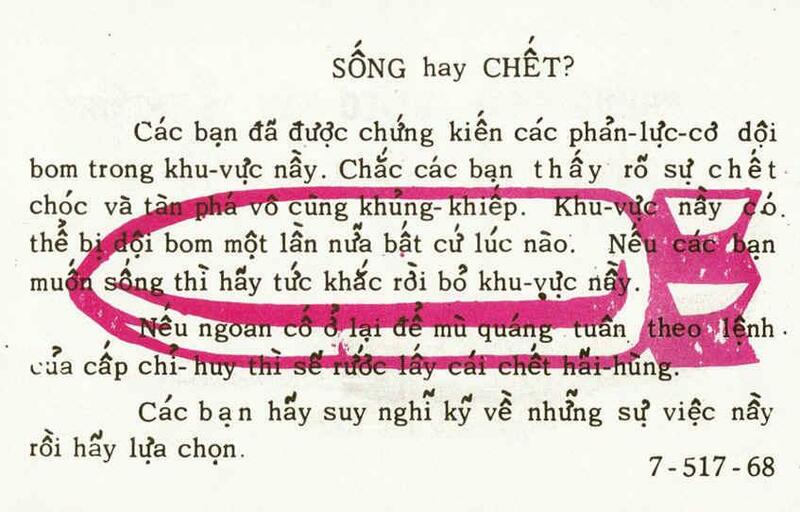 But, there is a Central Vietnamese accent too, and in the far south, the southern Vietnamese use a different colloquial than in other part of the country. That sounds a lot like the United States with our Bostonians and our Louisiana Cajuns. You have seen these jets bomb this area. You have probably seen the terrible death and destruction they cause. This area could be bombed again at any moment. If you want to live, you should immediately leave this area. If you stubbornly stay here, blindly obeying the orders of your superiors, you will die a horrible death. You need to think about this very carefully and then make your choice. 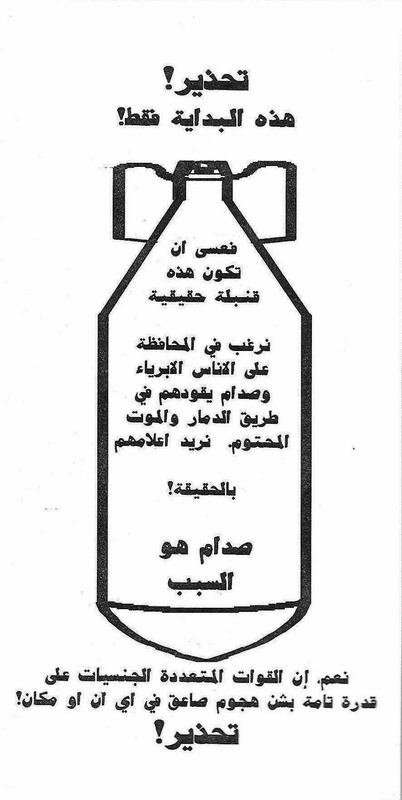 After Saddam Hussein sent Iraqi troops to invade Kuwait, the Americans retaliated with over 100 leaflets. This one is very stark and simply shows the BLU-82 super bomb. The BLU-82, sometimes called The Daisy Cutter, is a 15,000-pound conventional bomb, delivered from an MC-130E Combat Talon. It is too heavy for the bomb racks of any bomber. The bomb is actually a thin-walled tank (1/4-inch steel plate) filled with a 12,600-pound explosive "slurry" mixture. The 38-inch fuse extender is the Daisy Cutter component of the BLU-82 system. It explodes the bomb three feet above the ground with the result that maximum destruction occurs at ground level without a crater being formed. My God, the Yanks are using nukes. Brave Iraqi soldiers. Tonight some of you are going to die. Your families will miss you. May Allah rest your souls. Flee and save your life, or remain and meet your death! You have suffered heavy losses because we have used the most powerful and destructive conventional bomb of this war. It is more powerful than 20 Scud Missiles in respect of explosion capability. We warn you! We shall bomb your position again. Kuwait will be liberated from Saddam's aggression. Hurry and join your brothers from the south. We shall treat you with all our love and respect. Abandon this position. You will never be safe! 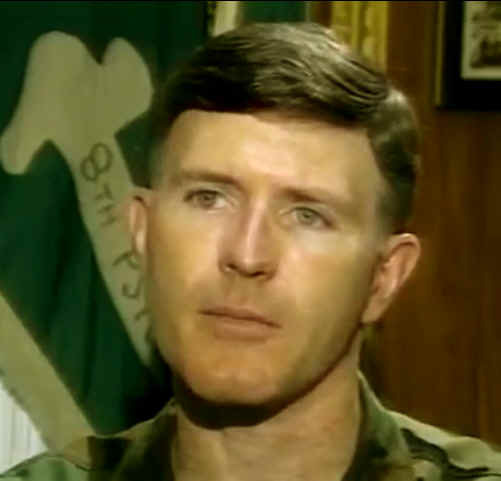 Colonel Jeffrey Jones, Commander of the 8th PSYOP Battalion used radio in partnership with Saudi, Kuwait and Egyptian forces, and broadcast in Arabic 18 hours per day for 40 days. They transmitted from two ground stations in Saudi Arabia, a platform in Gulf waters and a transmitter in Turkey. The PSYOP radio captured the Iraqi soldiers attention using dramatic methods. We would tell them that tomorrow we would drop on them the biggest bomb we had. Then, exactly as promised, we dropped a Daisy Cutter (BLU-82) that looks like a small atom bomb detonating. The next time we said we were going to drop another big one like that, the defections increased dramatically. One Iraqi soldier came across clutching 343 safe conduct passes he had been collecting. We found over 52 percent of defectors had been listening to our broadcasts. A second version of this leaflet was designed that was almost identical except that it had a red border on all four sides. 1,000,000 copies of this second leaflet were ordered. There is no data on dissemination although several rumors of the missions abound. 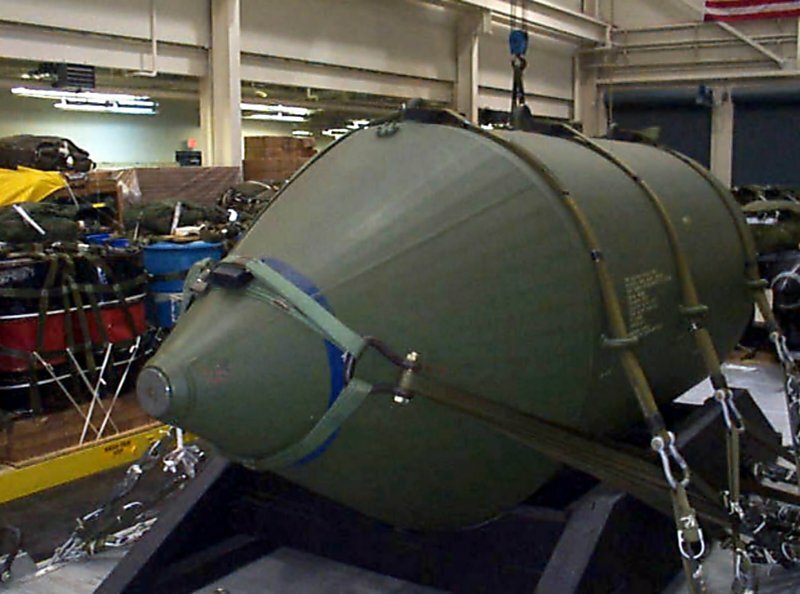 The USAF later used the BLU-82 bomb in Iraq and in Afghanistan as an anti-personnel weapon and for psychological effects. 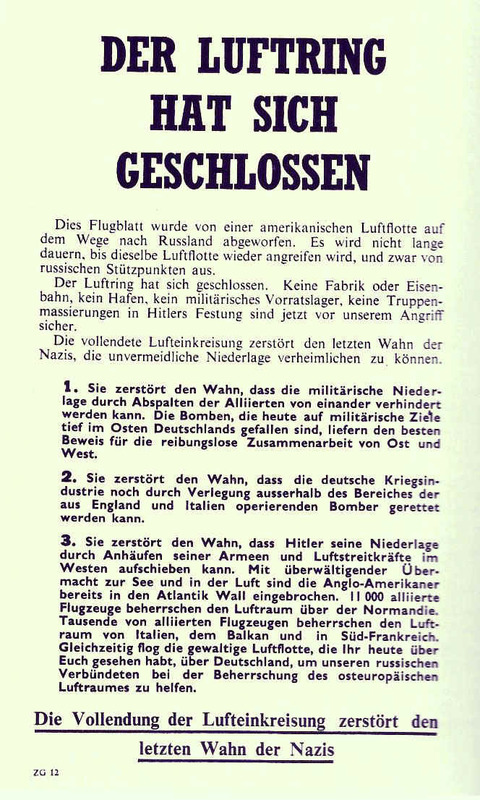 During the war the Allied Coalition dropped at least eight different versions of a bomb warning leaflet. Each of the first four depicted a different deadly scene on the back: A stealth fighter fires rockets at a tank and a fuel truck; two burning Iraqi tanks with 3 jet fighters overhead; a soldier runs from a burning tank, another soldier lies dead by a burning tank; and a stealth fighter firing rockets at Iraqi jets planes on the ground. There are two varieties of this warning leaflet. This is the LARGE bomb variety with the bomb measuring 4.25 inches in size. 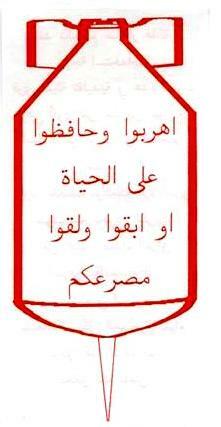 The Coalition called these leaflets the Strategic Air Series. They were usually dropped together as a mix. These leaflets were printed on bond paper for dropping by USAF C-130 Hercules and F-16 fighter aircraft. There are also four tissue-paper versions of the same leaflets that were apparently produced for clandestine use by the CIA. We will bomb this position soon. Leave your equipment and save your life. Your equipment is subject to bombing. Leave your equipment - or defend it and die. The choice is yours! Warning! This is only the beginning. This could have been a real bomb. We have no desire to harm innocent people, but Saddam is leading you to certain death and destruction. We want you to know the truth! Saddam is the cause. Yes, the Multi-national forces have the ability to strike anywhere, and at any time. The truth...eight years of war with Iran. Half a million needless deaths. The victories - gone. Now, a generation in peril. A world united against Saddam. No bargaining with him. Don't allow him to be the reason for your annihilation. Don't let Saddam lead you to destruction!! Saddam Hussein's policy of aggression towards neighboring countries is the sole reason for the bombing of Iraq and the targeting of military positions. The blame lies on Saddam Hussein. Iraqi military forces: Saddam Hussein's policy of aggression is the only reason for the bombing of Iraq. The bombing is for military targets only. The Multi-national air forces have overwhelming air superiority. Resistance is useless. The outcome is inevitable. Save yourselves. Leave your weapons and immediately go to a safe area. Saddam is to blame! The truth...Saddam has isolated you from the world. The Arab League, Muslim World League, and United Nations have all condemned Saddam's actions. Forces from 28 countries have assembled as a direct result of his actions and more countries join daily. Don't let Saddam lead you to destruction!! This is an interesting leaflet that also shows members of the Taliban hiding in underground caves. 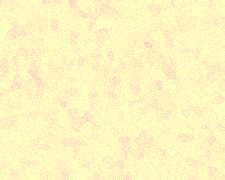 There is no text. Perhaps it was meant for those fighters that could not read. Whatever the theory was, you do not need to be able to read to understand the meaning of the leaflet. 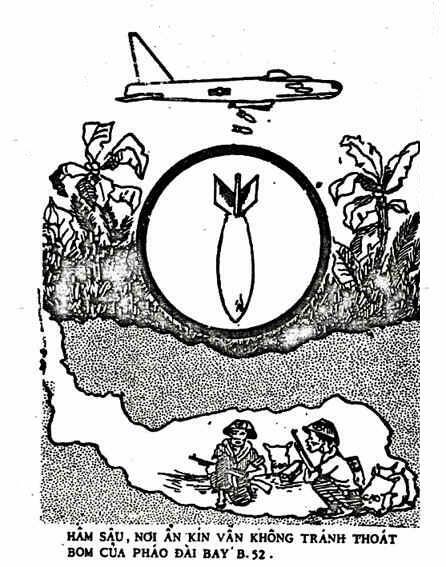 The front depicts three Taliban in deep caves under the ground as Coalition smart bombs head directly toward their hiding place. On the back of the leaflet, two of the entrances have been demolished and the Taliban is now trapped underground. In the third case, the bomb has yet to explode. The concept of dying a slow death trapped under tons of rubble must have been terrifying. 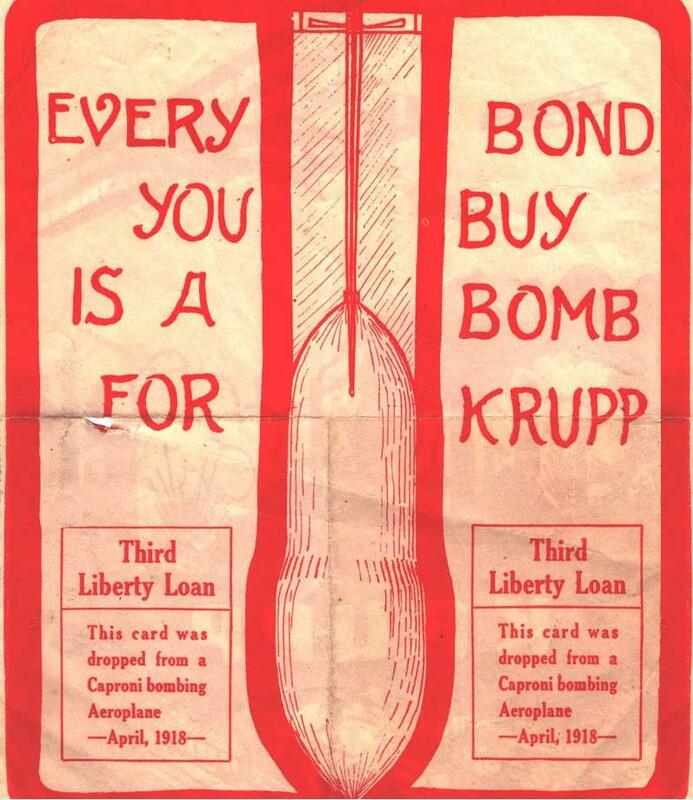 These bomb leaflets raising money war bonds and patriotic organizations were very popular and I have seen many different types. I show just a few such leaflets here. This Might have been a Bomb! This leaflet was dropped over Montreal, Canada and was designed to raise money for the war effort. It was dropped in various colors and languages. In the United States the people bought war bonds, notice that in Canada they bought war savings certificates. 1. Bomb warnings, where feasible are a powerfully effective means of adding to the desirable psychological effects of bombing, and in directing the behavior of people addressed into paths advantageous to the striking forces. 2. Warnings can be used to reinforce the fears of people and to induce in them panic and flight. 3. Warnings can be used to demonstrate materiel and military superiority. 4. Warnings can be used to reduce a target groups resentment against an attacking air force, and to increase the resentment which the people may hold toward their own political and military leaders. 5. Bomb warning messaging may also be used to discredit the enemys propaganda and to establish credibility for American MISO utterances. While Daughertys essay and conclusions focus on civilian target audiences, his conclusions equally apply to adversary military personnel as well. 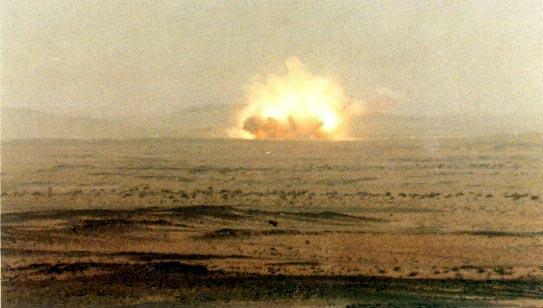 The results achieved by the dropping of bomb warning and surrender appeal leaflets on Iraqi forces during the First Gulf War amply support this assertion. According to COL (Ret.) Jack Summe, during this conflict, bomb warning messaging via Leaflets were used to support both combat and deception operations across the entire theater and had a significant impact in degrading enemy morale and his will to fight. Post-testing on Iraqi EPWs [Enemy Prisoners of War] found that 98 percent of the test group was exposed to leaflet products, 80 percent believed the PSYOP message, and 70 percent were influenced by the leaflets to defect, surrender, or otherwise cease resistance. Synchronizing the aerial bombardment of Iraqi forces with bomb warning messaging proved a most effective technique in amplifying the psychological effects of the bombing as well as establishing the truthfulness and credibility of our PSYOP messaging. Note: The Caproni was an Italian heavy bomber of World War I. It went through several upgrades as the war went on. Although Italian in design, they were also used by France and by the American Expeditionary Force. It had a crew of four in an open central nacelle (front gunner, two pilots and rear gunner-mechanic), and although each version had different capabilities, the Caproni 4 seems to have maxed the bomb load with 3,197 pounds of bombs. This is a very short look at propaganda leaflets and other products that used the terrifying image of a bomb as a theme. Readers who wish to comment are encourage to write to the author at Sgmbert@hotmail.com.